Lots of great hip accessories, including berets, scarves, bucket hats, purses, and a funky newsboy cap. Patterns include "Beret and Scarf - Orange and Brown", "Beret and Scarf - Blue", "Beret and Scarf - Blue and Brown", "Bucket Hat and Bag - Blue Version", "Rapper Cap and Scarf", "Flower Cap and Scarf - Winter", "Flower Cap and Scarf - Spring", "Flower Cap and Scarf - Summer", "Flower Cap and Scarf - Fall", "Cell Phone / Music Player Cases", "Beret and Scarf - Brown", and "Bucket Hat and Bag - Pink Version". Patterns range from Beginner to Intermediate. 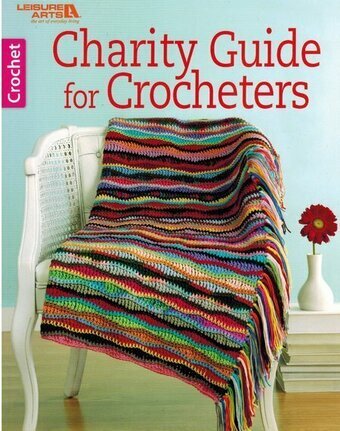 Crocheters love sharing the warmth of their handmade creations and this book makes it easy with a collection of the most popular charity projects. Includes a hooded scarf, hats, mufflers, preemie cap, baby blanket, baby booties, kid's slippers, puppet mittens, pocket lap robe, cuddle bunny, pet blanket & toy, and football. 64 pages. Kooler Design Studio presents young and trendy fashions to crochet by Mary Jane Hall. Featuring a variety of fun yarns, projects in Crochet Fashions include Pretty 'n Pink (fringed scarf), Scallop Shells (capelet and cap), Pink Pizazz (fringed shrug with furry trim), Linked Chain (scarf with floral end motifs), Lover's Knot (poncho), and All Curls (scarf with curlicues). 12 pages. Offering beautiful textures and colors at affordable prices, Red Heart Boutique yarns make wonderful choices for the crochet designs in Fashion Accessories. The cowl, hat, scarves, and shawls are chic examples of the stylish creations that are possible with Red Heart Soft and the following Boutique yarns: Sashay, Sashay Sequins, Swanky, Treasure, Unforgettable, Midnight, and Sassy Fabric. Projects include Crescent Shawl, Sweetheart Ruffle Scarf, Mitered Square Shawl, Butterfly Wrap, Desiree's Ruffled Scarf, Gradient Strip Scarf, Slouchy Beanie, Classy Cowl, and Ruffled Rose Pin. The fashionista will love these! 48 pages. Give the granny square a modern look with the fashions and afghans in Granny Squares Reimagined, featuring Heartland from Lion Brand Yarns. This sensationally soft, premium acrylic yarn comes in heathered and tweedy shades inspired by the natural beauty of the American landscape. Its subtle shades suggest landmarks such as the Redwood Forest, the Everglades, and Yosemite National Park. Made in America, Heartland is an easy-care medium/worsted weight yarn that is perfect for garments, afghans, and accessories. Projects include Askew Granny Afghan, Blue Moon Shawl, Tuxedo Afghan, Happy Granny Stripe Afghan, Granny Triangles Scarf, Buttoned Poncho, Granny Goes in Circles Afghan, and Granny Triangles Shawl. 48 pages. Staying warm and looking stylish can be one and the same thing! These 14 scarves, hats, and cowls to crochet with various weights of yarn are fashionable accents, perfect for any wardrobe. The scarves offer beautiful shapes and textures, while the hats include must-have slouch designs, a chic brimmed cap, and a trendy chullo. When the chill wind of winter is blowing, the cowls are delightfully cozy. With most for Easy skill level and a few for Intermediate, they're all fabulous gifts for family and friends. Just don't forget to crochet a few for yourself! 48 pages.